Are you constantly looking for the next upgrade you can make to enhance your engine? Whether you’re talking about a muscle car, motorcycle, high-performance truck, or even a personal watercraft, getting key parts of the engine honed out in Chatsworth CA provides a simple path to enhanced performance. Getting a part honed out in Chatsworth CA involves smoothing the interior surfaces by polishing away some of the surface of the metal. While hand honing is possible, it is not the most efficient process. It takes far too long, and it may not reach the deepest interior passages. Abrasive flow machining is faster and easier. All interior surfaces can be reached and smoothed evenly. This is made possible through the use of a specially formulated polymer media that, when pressurized, conforms to the shape of the interior passages and abrades them on all sides. This media suspends the abrasive particles uniformly and allows them to recirculate so that you get even surface removal on every twist and bend. 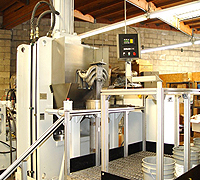 What Kind of Parts Can Be Honed Out in Chatsworth CA? With the right abrasive media formulation, just about any part that air or fuel flows through can be honed out in Chatsworth CA. If you only hone out one part, make it your intake manifold as this will deliver the biggest performance gains. One part that cannot be honed out is the header; however we can put a weld bead on the outside and then smooth down the inner weld to create a better angle for you. Extrude Hone pioneered the automotive abrasive flow machining process, which is now accepted and used worldwide to improve performance at top brands including Ford. Thanks to our many years of experience, you can trust us to provide superior quality extrude honing that will remove the exact amount of material you specify. Because our results are always replicable, we can hone parts separately for perfect flow matching. If you need components honed out in Chatsworth CA, please Call Extrude Hone at (562) 531-2976. We’ll be happy to give you a quote and a time frame for the project.